Before purchasing this palette, all I ever heard was Morphe this and Morphe that. Every review have seen was very positive and persuaded me to try this brand. Now because the company name is Morphe Brushes I thought that they only sold brushes. Now before I continue, I just have to say that some of the items I've purchased is because of Instagram. Makeup tutorials and products are all over my explorer section. So anyway, I saw that Morphe was launching the 25 A Copper Spice and 25 B Bronzed Mocha eyeshadow palettes and I knew I wanted them in my life! So I wanted and wanted till the launch day and I finally got my hands on one of them. Obviously by the title you can already guess the one I chose to purchased. Row 1: The first three colors are great for the highlight on the brow bone. You can even use them to add spice on your tear duck. When you look at these colors, they seem kind of plain at first glance. But after you swatch it's far plain, especially the first eyeshadow. The color is gorgeous and very bright. This could even work as an highlight on the face. Row 2: I'm a simple person so I really like how this row is not to loud, it's toned down. However in my opinion, this row is not as pigmented as the others. So you have to build up the color. I think creating a smoky eye will actually work for this row. Row 3: This row is similar to the first row of eyeshadows. Both rows have some colors that shimmer and I think they compliment each other. Also this row reminds me of Summer and the colors are like watching the sun set. Basically it's all things summer! Row 4: The colors in this row are very pigmented. I'm in love with the second color in this row. It's a combination of gold and brown shimmer! It would go great on the eyelid for a simple sunset beach look. Row 5: Like row 2 these colors simple, but the result is different as far as the pigment. This row looks really similar to row 4. I really like these dark colors, it's reminds me of the smoky eye look. But if you're like me and want to brighten up the smoky look, you could add some of the light shimmer colors to the look. Maybe in the inner corner of the eye or in the middle for a pop of color! 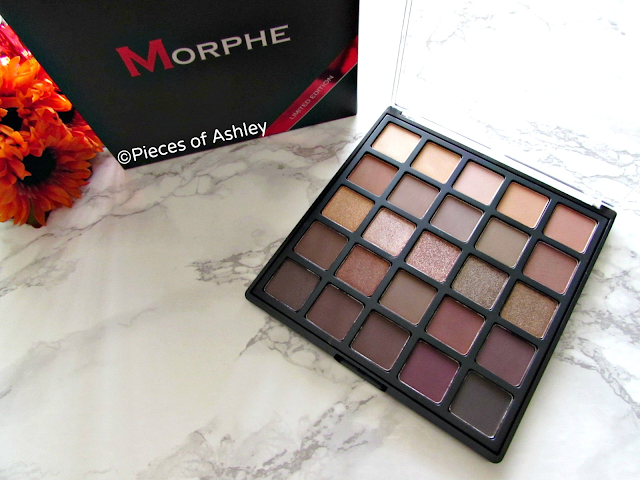 I hope you enjoyed reading about the bronzed mocha eyeshadow palette by Morphe!